A tulip doesn't strive to impress anyone. Lovely, brilliant colors... no striving, just gorgeously hanging there as if they don't care. Stunningly beautiful! I have enjoyed catching up on your posts since I've been away and reading your recipes. What terrific food pics. Thanks for taking time to post it all. Definitely one of my favorite flowers - I just wish they lasted longer! My very favorite of flowers! Thanks for the lovely peek! Beautiful coloured tulips. Youare right -like all flowers they just are. The last meal looks tasty. Thanks for your comments and encouragement. I am hoping to get 2 more chapters up by the end of the week about walking in faith. How beautiful!!! 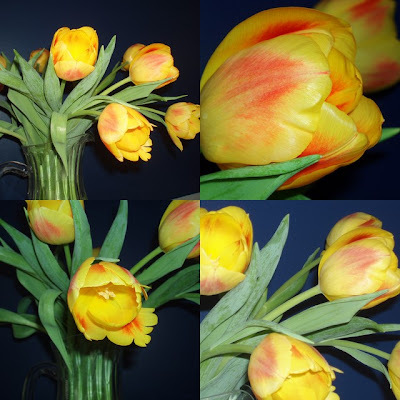 Tulips are one of my favorite flowers!